The 22nd beer from the advent calendar was a Winter Saison produced by the gents at Rooie Dop, a brewery out of the Netherlands. Interestingly enough, while these gents do brew small batches at their own brewery located in Utrecht, their large batches are brewed by the Brouwerij De Molen who produced our 19th beer! 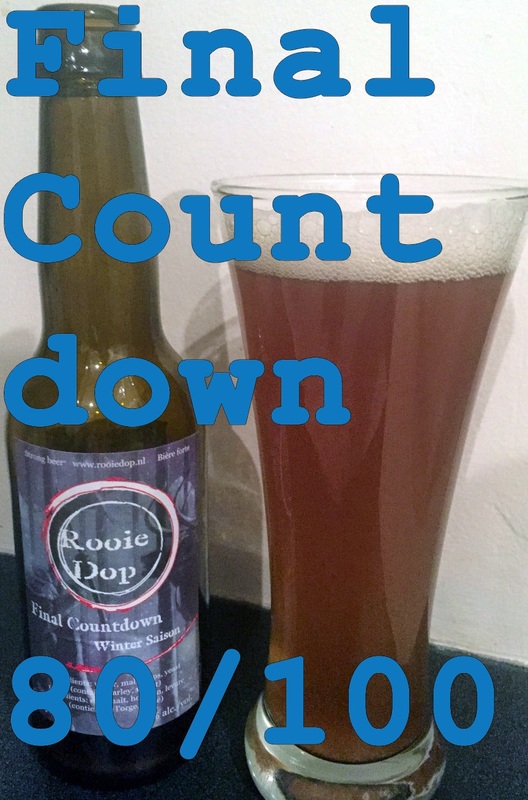 Rooie Dop is a brewery that wants to make some flavourful and sometimes experimental beers. They do a lot of collaboration with their beers and don’t really care about the rules for brewing particular styles of beer, they “care about flavor” as they say on their website. The brewery was started y three friends some years ago. Mark Strooker is the one who calles the shots at the brewery and is an IBU extremist according to his profile (I like this guy). Overall the brewery sounds unique, creative, and over all talented based on being rated one of ratebeer.com’s 2013 best. The beer we get to try today is a Winter Saison. Again, Saison’s are broadly defined pale ales that are higher in alcohol content, highly carbonated and generally spiced. They are traditionally a Belgian style of beer which means they include the wheat and barley malts which produce a creamier mouth feel. This particular Saison is called “Final Countdown” and was produced using smoked malts and rye. It was specifically made for inclusion in this year’s Advent Calendar and that is pretty exciting. Onto the beer! Appearance: Cloudy amber colored beer with good head that dissipates rapidly. Smell: Smoke and apricot are right at the front. Interesting combination that isn’t unappealing, actually. Taste: Very smoky with a hint of fruit notes in there. Sweet malty balance that goes well with the smokiness of the beer. Reminded me a little bit of being at a campfire though, which wasn’t wholly appealing, but not terrible either. Mouth feel: Good carbonation, creamy mouth feel, light body. Overall: Definitely a unique beer for me. I’ve had smoked beers out of Germany before which taste like you are drinking the campfire. This one was lighter and had that pleasant creaminess of a saison. As a Saison I’d say it was good with a unique flavor balance and some risks taken that turned out pretty okay. Do I like it: I enjoyed this beer for the risk that was taken in producing it. Adding smoked malts to a saison is an interesting idea that I didn’t know if it would work. Overall it worked well enough to taste good, but I wouldn’t drink it again.